There are many kinds of mallows in Britain and Ireland, including several garden escapes. Mallows are usually solitary plants, but on waste ground they can on occasion provide an impressive blanket cover. 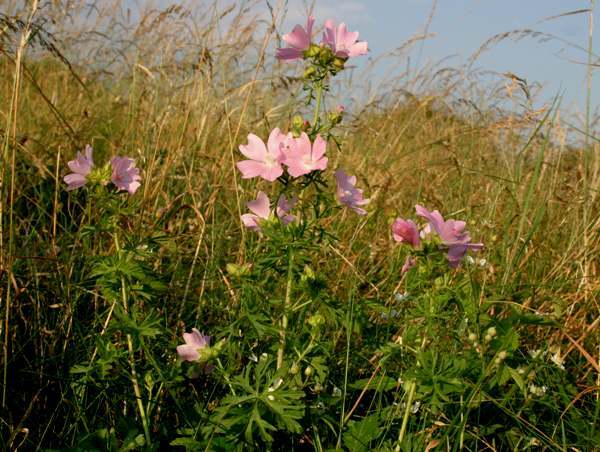 The Musk Mallow usually grows to about 60 cm in height and has alternate, palmate leaves with five to seven lobes. The upper leaves are deeply cut while the basal leaves are only shallowly lobed. Musk Mallow flowers are 3.5 to 6cm across and are borne in clusters in the leaf axils. Individual flowers are 3 to 5cm in diameterand have five bright pink veined petals with truncated to notched apex. In Britain and Ireland this is mainly a southern species, becoming increasingly scarce in Northern England and Scotland. 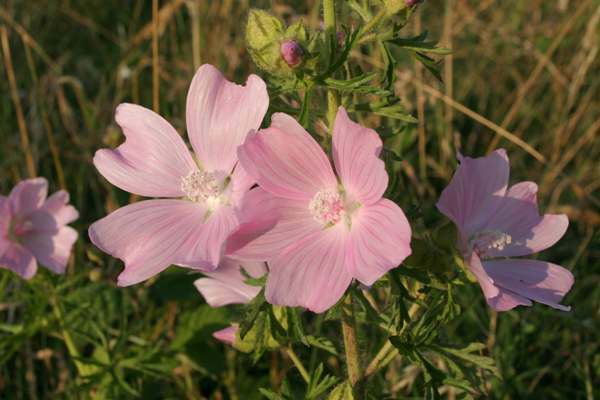 In central and southern Europe, there are many species of Mallow, but this one that can be found throughout the region from Spain and Portugal to Germany and Poland - for example, we have seen Musk Mallow in France, Slovenia and Italy. To the east its range extends into Asia, including parts of western Russia. Musk Mallow favours dry soils and is often found in field margins, on waste land and roadside verges, and in churchyards. 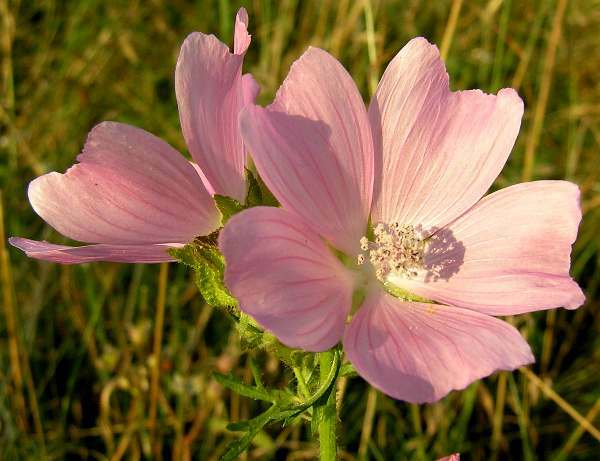 In Britain and Ireland Musk Mallow produces its flowers in July and August. The common name and the specific epithet both refer to the musky odour of this wildflower. Musk Mallow has been introduced and cultivated as a garden plant throughout the temperate world includung North America, Australia and New Zealand. The leaves are also reported to be an edible addition tosalads, but we cannot recommend hat any wildflowers are picked for eating without first seeking expert advice. The specimens shown here were photographed in mid July on the edge of a sunny field overlooking the River Dee, near Llangollen.